I Love the way Louise makes her cooking classes relaxed, informative and fun, even when everyone is firing questions at her. I have enjoyed all the classes I have done so far. I have learned so much about healthy, delicious, nutritious food, discovered new flavour sensations and new methods of cooking. 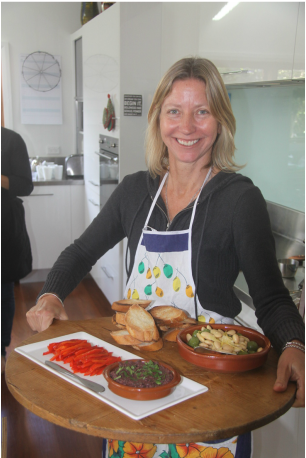 I would highly recommend these classes to gain knowledge in preparing exciting recipes with fresh produce and it is so nice to sit down and share the meal with everyone at the end of the class. This is a note to thank you so much for all your hard work and stunning catering at our party last Saturday night. We had many comments on the evening and have received phone calls, texts and emails since then thanking us for the night and commenting again about how fantastic the food was. Many said that it was the best cocktail food that they had ever had, with everyone impressed with the quality, variety and taste. Most said that they ate numerous pieces of the nougat because they said they'd never tasted nougat so delicious. So, all in all, the whole night was a huge success due, in no small part, to your fabulous food contribution. I hope you enjoy your Christmas and New Year break and no doubt we'll catch up again in 2013. The kids loved the school holiday cooking classes and are keen to take over the kitchen. I made the vietnamese poached chicken salad again as part of a birthday dinner last week. It is such a winner.